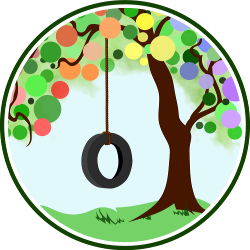 This entry was posted in Breastfeeding, Feeding With Love, Natural Learning, Playtime and tagged breastfeeding, child, newborn, play, toys. Bookmark the permalink. We use my son’s cars as the basis for many different kinds of play. After 23 months of having 100% of my attention, I wanted my son’s transition to being a big brother to be as gentle and natural as possible. During my husband’s paternity leave, Big Brother received constant dedicated attention from my husband as I took the lead on caring for our baby girl. When my husband went back to work, I wanted Big Brother to continue to feel like interacting with him was a priority for us, but the reality was that I was somewhat confined to the couch due to Little Sister’s breastfeeding needs. This led to my coming up with many ways to play with my son while still breastfeeding my daughter. 2. Take out the art supplies and suggest projects as you nurse. 3. Read, read, and read some more. 4. Play sorting games. 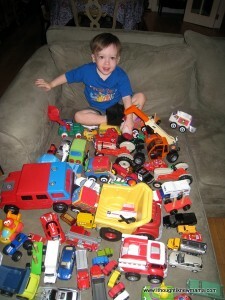 My son will often take out all of his cars and trucks and I will ask him to sort them by color, size, type, etc. 5. Set up sensory bins and nurse nearby. 7. Play pretend games. I am often the voice of one of my son’s cars or little wooden people as he creates an imaginary setting around me. 8. Play Red Light, Green Light. 9. Make music together. I can easily play an instrument like the triangle or maracas while nursing to compliment my son’s music making. 10. Hide and seek – except instead of hiding yourself, take a couple of minutes before nursing to hide objects around the room for your toddler to find. How do you give your older child attention while tending to your baby? I generally read to my toddler while I nurse, too. There are also plenty of times when I just loosen the Ergo so that I can nurse baby as I run after… TODZILLA. Ha! I don’t know how I would have gotten through the first six months without nursing in the Ergo! Great ideas! The kids have played hide and seek with a plastic spoon before, you could definitely arrange a quick scavenger hunt! My daughter and I love reading while I nurse the baby. 🙂 I will have to try some of these, thanks! Charise, are you writing blog posts just for me? It feels like you have a direct line to info that I need to read during this season of my life. Thank you so much! You’re so sweet, Jennifer! I’m so glad this is helpful to you! These are some great tips to keep in mind for if/when we have a second. I have always wondered how to keep Destructo entertained and not destructoing while I sit for long periods of time nursing a newbie. I am 7 months pregnant with my second and have been wondering how it is going to go. Thank you for some advice! Can’t wait for her to be here, but also making sure to love this time with just my son! While I don’t use a nursing cover when I’m breastfeeding in public, I have found that using one for the sole purpose of UN-distracting my baby has been most helpful!